Here's a stunning new picture book that's had even my adult visitors intrigued. 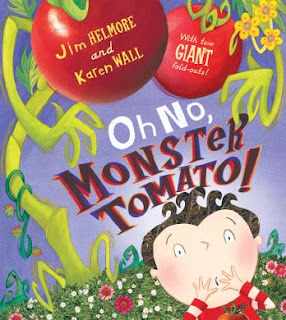 Oh No, Monster Tomato! grabs your attention with a quirky story, delightful art and two giant fold-outs that explode from the book. It was written by Jim Helmore, illustrated by Karen Wall, and published by Egmont (2009). In the dark town of Grislygust a competition is under way - The Great Grislygust Grow-off. 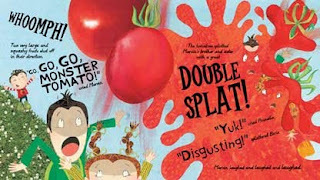 Marvin plans to grow the tastiest tomatoes in town but his beastly brother Boris and his poisonous sister Prunella make fun of him. 'You're a titchy weed, Marvin, and your tomatoes will be tiny too!' But Marvin is determined to prove everybody wrong and soon his competitors will find themselves in BIG trouble. Helmore knows how to make a young audience laugh, and have fun with words. The book design really enhances his story. We read about the Great Grislygust Grow Off, fruity-shooty tomatoes, splots and splats, and so many other delicious words, all in fonts specially designed to show them off. Like most great children's picture book illustrators, Wall has given children lots of engaging details to capture their interest and add an extra layer of meaning to the story. She has made digital collages which add vibrancy, colour, pattern and texture to the pages. At first glance, the book is very busy. There IS lots of visual activity, but it's not chaos - children's eyes are led from left to right and top to bottom, the natural reading way in our culture. There are two songs already in the book - can children create their own about another fruit or vegetable? Can they devise an instrumental accompaniment for it? Saucepans count as instruments! There's also lots of alliteration and onomatopoeia, making this a perfect book to use with older kids when you need a model of such devices. Kids could experiment with growing their own fruit and vegetables. Measure the growth of seedlings each day, record and compare. Even senior primary students will appreciate the humour in this book and use it as a model for their own picture book creations. Use Karen Wall's illustrations as inspiration for developing kids' own art work.